Northern Norway. 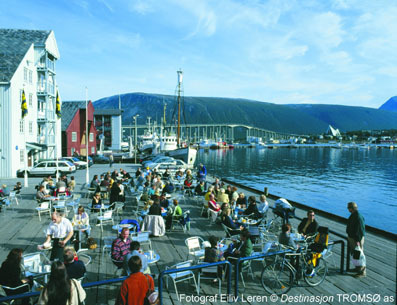 Tourist Information and Hotels in Trondheim and Tromso. Self-drive Holidays in Northern Norway for the Independent Motorist. Northern Norway stretches for over 1000 miles, from below Trondheim in the south to the borders of Finland and Russia, well north of the Arctic circle. Trondheim and Tromso are the two main cities, both well worth a visit, especially Trondheim with its impressive cathedral and attractive old centre. The main road north crosses the Arctic Circle before reaching Bodo, and from here on the scenery is true wilderness, punctuated with the occasional small town. The Lofoten Islands - scenic Norway at its best - Towering mountains with pointed peaks which reflect the red glow of the midnight sun. White beaches with clear green water and sea teaming with fish, and tiny fishing villages with ochre-painted houses. 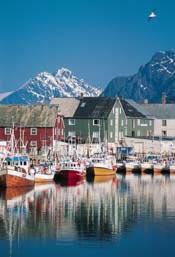 The Lofoten Islands are Norway's most scenic holiday destination. Just off the coast between Bodo and Harstad, the islands are reached by ferry from Bodo or a road from Harstad. The North Cape is the most northerly mainland point in the World. The dramatic cliff is 307 metres above the North Atlantic Ocean, sometimes illuminated by the midnight sun. Take the nearby Gjesvr Bird Safari to a nature reservation with over 2 million seabirds. Between the sharp craggy peaks of the Lyngen Alps lies the worlds most northerly university town. Troms combines wild scenery with pulsating, urban life. 360 km north of the Arctic Circle, yet the climate is moderated by the Gulf Stream. As well as boasting two cathedrals and some worthwhile museums, the city has a lively nightlife, thanks to its university. Troms and its environs have everything North Norway has to offer: Mountains and fjords, glaciers, forests, wide open plains, Sami culture, museums, and every sporting activity you can imagine. With its 150.000 inhabitants, Trondheim is Norway's third biggest city. Trondheim has been an important travel destination since the Middle Ages and is today a modern town welcoming visitors from all over the world. Fortunately the ancient centre has remained remarkably intact. 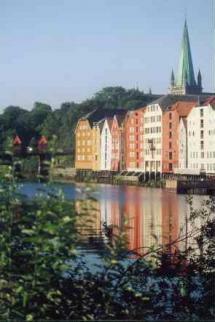 The river Nid flows through Trondheim to the sea, and its banks are lined with imposing hoses and gardens. The cathedral is the largest medieval building in Scandinavia, and is the one thing to be sure of visiting. The area around is cluttered with old warehouses and timber dwellings in narrow streets. There's no shortage of things to do in the evenings, as the many bars and restaurants are well-patronised by the large student population as well as the locals.